The webcam was originally installed as part of a project by the Wildlife Conservation Society to bring attention to the migration pathway many pronghorn take to reach summer range in Grand Teton National Park. Each year, approximately 300-400 pronghorn from the larger herd make the trek all the way from the Red Desert to the Park and back again, a pathway that has been named the Path of the Pronghorn. 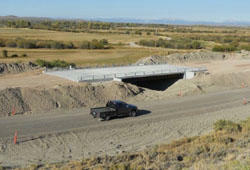 The wildlife overpass bridge at Trapper's Point over U.S. 191 is part of a larger project done by the Wyoming Department of Transportation. The Wildlife Conservation Society (WCS) helped identify intersections between pronghorn migration corridors and US 191 where under and overpasses with fencing could guide pronghorn safely across the road and reduce wildlife- vehicle collisions between pronghorn and motorists. 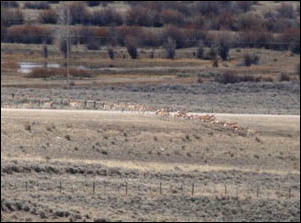 In 2010, the Wyoming Department of Transportation (WYDOT) used this information, along with complimentary data from Wyoming Game and Fish Department and other researchers, to invest $9.7 million along US 191 to install fencing and crossing structures to protect both wildlife and highway travelers. In the fall of 2012, 8 wildlife crossing structures and 23 kilometers of fencing were completed along a 12-mile stretch of highway. A second wildlife overpass bridge is located about five miles north of the Daniel Junction. Wildlife biologists have cameras at some of these locations. WCS is currently studying the effects of the structures and the adaptations of the pronghorn at Trappers Point in order to utilize lessons learned in other crucial wildlife road crossing locations around the world. Wildlife Conservation Society (WCS) researchers have been studying the Path of the Pronghorn since 2003. 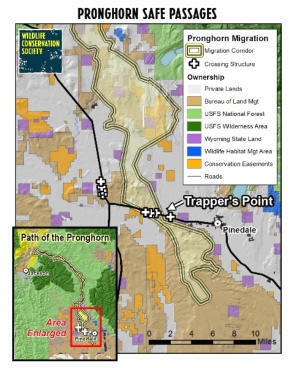 In 2008 the Path of the Pronghorn became the first federally designated migration corridor. Years of field research by WCS were pivotal in the effort to designate the first and only federal migration corridor in the U.S. Further, this research helped inform the Wyoming Department of Transportation of the optimal locations for installing wildlife crossings and fencing to protect the migration and drivers. The live web camera installed on the overpass provides the public with a real-time look at activity on the overpass and gives researchers additional information about the timing and numbers of wildlife movement patterns. 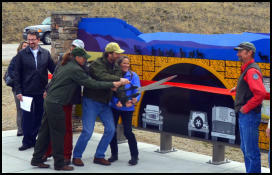 The Ribbon Cutting Ceremony for the Path of the Pronghorn Wildlife Crossing Structures Interpretive Site was held on Wednesday, April 13, 2016 at 5:30PM at the Wyoming Wildlife pullout. 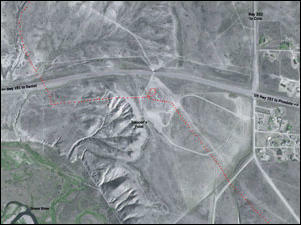 It is located approximately one mile east of the Trapper's Point wildlife overpass bridge on U.S. 191 along Duck Creek. 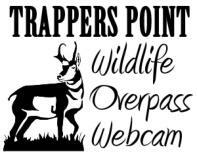 Pinedale Online took over as managers of the Trappers Point Wildlife Overpass webcam on April 1, 2016. We are excited to be able to help continue to make this webcam available to wildlife researchers and for public viewing. The webcam allows researchers to learn more about the seasonal movement patterns of big game wildife in the Upper Green River Valley, as well as offering people from all over the world a chance to observe these animals in real time through a live video feed. We welcome suggestions from researchers and interested persons on ways to make the camera more beneficial and to help educate the public on conservation, well-thought out land-use development to accommodate multiple uses, wildlife management challenges and opportunities, and non-disruptivel wildlife viewing practices. Wildlife Conservation Society (WCS) researchers have been studying the Path of the Pronghorn since 2003. In 2008 the Path of the Pronghorn became the first federally designated migration corridor. Years of field research by WCS were pivotal in the effort to designate the first and only federal migration corridor in the U.S. Further, this research helped inform the Wyoming Department of Transportation of the optimal locations for installing wildlife crossings and fencing to protect the migration and drivers. The live web camera installed on the overpass provides the public with a real-time look at activity on the overpass and gives researchers additional information about the timing and numbers of wildlife movement patterns. The Trappers Point Wildlife Overpass camera administrators include Pinedale Online and wildlife biologists with Wildlife Conservation Society (WCS). The camera view may change out of the programmed patrol sequence at times by administrators who are controlling the camera. It is important to allow wildlife biologists and researchers to continue to access the camera in order to not disrupt their studies of the pronghorn movement patterns. For more information, please call Pinedale Online at 307-360-7689 (ok to call or text anytime, including after hours and on weekends), email support@pinedaleonline.com, or stop by the Pinedale Online office in the back of Office Outlet in Pinedale, 43 S. Sublette Ave during regular business hours (M-F, 8:30AM to 5:30PM). Communication for the Trappers Point Wildlife Overpass webcam is provided by Live View Technologies in Orem, Utah. The camera has pan, zoom and tilt capabilities and operates with cell phone and satellite technology powered by solar panels. LiveView also administers many of the Wyoming WYDOT highway webcams. News articles about the U.S. Prior to the wildlife over and underpasses being built, migrating animals had to dart across U.S. 191 whereever they could find a place to cross, risking death and injury to both animals and travelers. Pinedale Online photo from 2006. Overhead view from 2006 showing the Trappers Point bottleneck prior to construction of the over and underpasses. U.S. 191 goes left to right across the middle of the page. The Cora Junction is on the right; north goes to Green River Lakes, south is the East Green River Road. Pinedale is about 7 miles to the right (east). The funneling point is the cattle underpass under the highway. 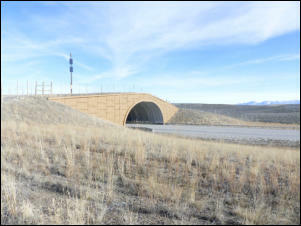 One of two wildlife overpasses built by the Wyoming Department of Transportation in 2011 along U.S. 191 in western Wyoming. Pinedale Online photo. Trappers Point Wildlife Overpass webcam. 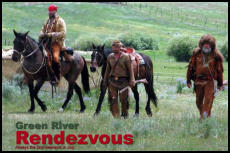 Photo by Pinedale Online! 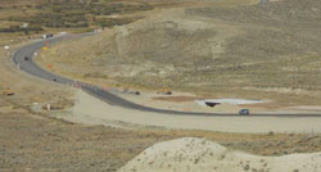 Below photos show construction of wildlife underpasses along U.S. 191 between Pinedale and Daniel Junction in 2012. 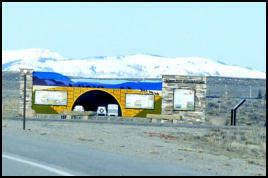 Center photo by Wyoming Department of Transportation, others by Pinedale Online! the Musem of the Mountain Man in Pinedale, just five miles to the east. See www.mmmuseum.com for more information. Property (TCP), the first ranching related TCP in the nation. 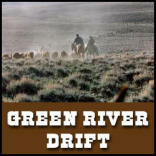 See www.greenriverdrift.org for more information.